On Friday, November 23rd, The Chinese Language Program hosted their first Chinese Heritage Final Project festival. 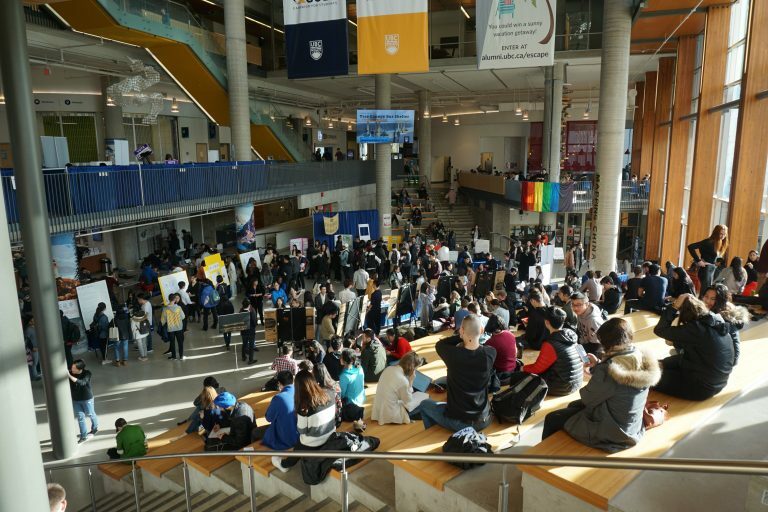 The festival was brought together by our Faculty members, Teaching Assistants (TA), Work Learns (WL), UBC Hanfu Culture Society, volunteers, as well as our Chinese Heritage learners from CHIN 141, 241, 341, 345, 441, and 445. By means of essays and presentations, students are expected to investigate China from different perspectives, enhance and broaden intercultural comprehension and perspectives, as well as promote Chinese culture and introduce the Chinese society and culture to a broader audience through presentation, interpersonal and interpretative language skills. On the day of the event, there was a total of 56 groups that presented. Based on their assigned topic, each group had to decide upon a subject matter, or a character, or a phenomenon, or a story which they are interested in researching about and could best address to their topic. Topics presented from CHIN 141 included “华人生活方式 How to flex like a Hua Ren,” “中国连续剧 Chinese Drama;” From CHIN 241 included “梁山伯与祝英台 Butterfly lovers,” “孟姜女 Lady Meng Jiang;” From CHIN 341/345 included “社会时事版 （2251）Social Affair Section,” “体育版 （1751）Sports Section;” From CHIN 441/445 included “张学友 Jackie Cheung,” “徐志摩 Zhimo Xu.” Some of the Chinese heritage learners presented their chosen topic in all kinds of interesting ways including singing, dancing, acting, as well as cosplay. To instill more engagement between our students and the audience, ping-pong balls were also given to the audience to vote for their favourite groups. In the exhibition area, a photo booth was set up for everyone to take wonderful pictures with their friends. There was also a raffle booth filled with wonderful gift prizes to be won. Family and friends alongside with faculty members came to listen and watch our student’s final project festival. There were over 350 attendees present during the exhibition. Thanks to all the students for their wonderful performances, it was an eye-opener and an interesting experience for audiences. The event was inspirational and engaging for students to advance in their path for learning Chinese. Once again, huge thanks to all faculty members, TA’s, WL’s, UBC Hanfu Culture Society and volunteers for putting the exhibition together. The exhibition was a very successful event and thank you for participating and we hope to see everyone next year!